What does it mean to have a city live in your soul? To have it shape your very essence? It’s a sentiment difficult to articulate, and the citizens of Varanasi, or Kashi, which means “light", find it hard too. However, they would immediately grasp what the question intends to probe. One such person is Hemang Agrawal. The 35-year old graduate from the National Institute of Fashion Technology (Nift) in Delhi returned to the city he grew up in within a year of his graduation (2001), eschewing conventional wisdom that dictated he make his name in bigger cities. “During college, there was this ambivalence between textile and fashion, but then I attended a talk by Rahul Jain—one of India’s leading textile historians—in Varanasi and was convinced that textiles is what I want to focus on." 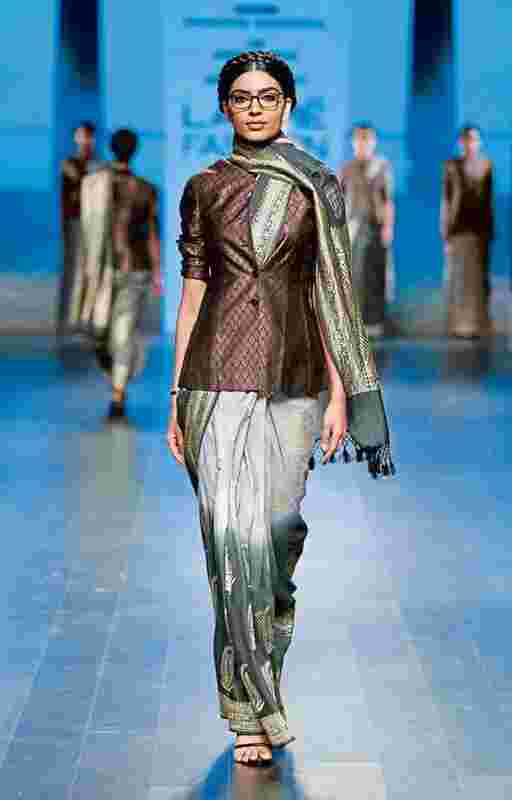 In March, Agrawal had his first show at the Summer/Resort 2016 edition of the Lakmé Fashion Week (LFW) in Mumbai, where his collection The Holy Smoke paired achromatic Banarasi saris—handwoven silks in Karhuan, Jala and Gethua techniques—with jackets. “The impression of Banaras is incomplete without smoke, whether it is the smoke of the aarti, the smoke from the pyres at Manikarnika ghat or even the smoke of a tea maker. That was our inspiration," he explains as he walks us through the twisting, medieval streetscape of the city. For Agrawal, his fashion week presentation was a one-off. Otherwise, he prefers to steer clear of the label of a fashion designer. “I did it because the theme of LFW Textiles and Sustainable Fashion Day was hand-in-hand—craft-based textile in which a weaver and an artisan are jointly important. The ramp is not so much about the textile or garment, it’s about drama and visuals," says Agrawal. His show concluded with him taking a bow with his master weaver, Sharfuddin Ansari. He is not just talking the textile talk. The first thing he did when he returned to Varanasi after Nift was to learn weaving, which took him almost a year and a half. He doesn’t manage to spend as much time on the loom these days as he would like to but considers it almost akin to “therapy…a kind of Zen activity I can’t explain". Fashion, the way it is understood the world over, is about the finished product, but Agrawal says that in India, the textile often was the garment, be it the dhoti or the sari. “Textile too has glamour, but it’s very different from what you see in fashion," says Agrawal. It’s a connoisseur’s medium, he feels, one which is free from all the trappings that a garment from a major fashion label can carry. In a city famed for its lushly coloured and beautifully woven saris, there was another tradition, one which still exists but only barely—that of using pure silver to weave the motifs. This was known as “sachi zari". It involved silver twisted around a core yarn in the loom and was used for ornamentation. “Metal is a large part of what we do now," says Agrawal—but not in the traditional sense. He uses silver yarn to make scarves, throws and garments, all contemporary in nature. At his office in Varanasi’s Sidhmata Lane, Agrawal shows us bolts of houndstooth patterns woven with silver and a dull gold scarf woven completely with metal, which is on its way to a showroom in Tokyo. It uplifts even the mundane office surroundings with its understated yet obvious glamour. “Traditionally, metal was in the weft, but we have introduced it in the warp. It wasn’t an easy process, even though the idea had been stewing with me for quite some time. It’s very difficult to execute," says Agrawal. That’s because of the reed (the comb through which the yarn is passed) installed in most of the looms in Varanasi. “It’s a very fine reed. It is impossible to pass even coarser counts of cotton through it, so metal, of course, is far-fetched," he explains. Agrawal redesigned the entire loom, fashioning the reed out of bamboo and steel etc., but even then it took the better part of a year before he had a satisfactory first piece. He currently retails these products under his label in stores in Paris and Tokyo, but declines to name the stores. “We haven’t started retailing in India as production is limited," he says. Agrawal is very sure that though his label is still evolving, his sensibilities are a mix of the old and the new. “Don’t design one more paisley, it’s been perfected already. We can’t go overboard with colours and motifs; it’s like a pizza with 60 toppings when all you really need to concentrate on is the base."